I want an ombre manicure. This was the inspiration for this floral nail art design. And surprisingly, I used a pink palette! My sister's love for the color is probably rubbing off on me. After painting my digits, I realized this is not the first time I used pink for an ombre nail art. Do you remember my pink birds nail art? The idea for this hand-painted nail art is simple, I wanted a floral design with a twist. After scribbling a few ideas, I decided to enclose the flowers on circles and added stitch marks for a patched look. I once again tried to develop my fondness for pink and chose to wear 2 coats of China Glaze Beach Cruise-r as base color for this floral manicure. It is a slightly shimmered polish with excellent formula. Application is not a problem at all. The entire design was done freehand using acrylic paints and a detailing nail art brush and dotting tools. To achieve that ombre look, I only use shades of pink to paint the design. 1. First, I painted a big circle at random places on all my nails. I used a lighter shade of pink for the circles. 2. I then painted a white flower inside each circle. 3. 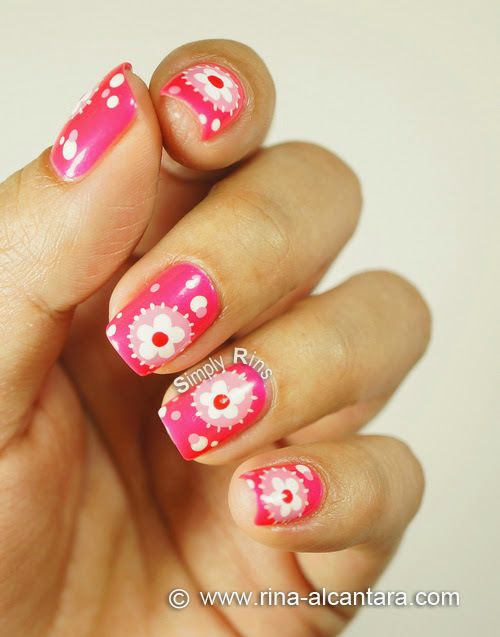 Using a dotting tool, I used the base nail polish for the center of each flower. 4. Add stitch marks around the circle using white acrylic paint to achieve a patched look. 5. Finally, I dabbed a few dots of different pink hues on awkward spaces. I am still unsure how I feel about this manicure but I think I will eventually like pink on my nails. And I really do like how this nail art idea turned out. It looked dainty and fun at the same time. It also made me feel more girly. I think pink has that effect. If you're a nail art beginner, I can recommend this design for you. It is very manageable even with your non-dominant hand because you'll be working with simple shapes. The flowers can also be painted using a dotting tool if you are more comfortable that way. The hardest part would probably be the stitch marks. As an alternative, you can have thicker lines but space them wider apart for easier painting. How cute!! I love it! !